I’ve been told by a few people now that I should start a blog so here it is! If I’m going to do it properly, I’m going to aim for a weekly post on a Sunday. I’d like to stick to everyday paleo recipes, dishes that people can cook up mid week that are simple and easy. I was going to say quick but this first recipe does take a little bit of forward planning to roll the meatballs, but if you’re anything like me that can be quite a soothing experience while you watch Lifestyle Food on Foxtel! This recipe is inspired by a Malaysian dish where you cook prawn patties in a sauce made from sweet potato. I decided to do something similar but make some delicious pork meatballs instead. You can use any kind of mince but I like that pork mince holds together really well without having to add any extra ingredients. They also cook really quickly. The sauce is a little bit spicy, thick and has a nice ginger kick. It reminds me a little bit of the pumpkin dhal my Mum makes. Let me know in the comments if this is something you would make! To make the meatballs, combine the ground coriander and cumin with the mince, season with salt and mix well with your hands. Roll into decent sized meatballs, about 2 tablespoons worth. Heat the coconut oil in a saucepan (or any other fat appropriate for frying). Brown the meatballs and set aside, you may need to do two batches. Steam or boil the sweet potato until tender and blend with 1 cup of the chicken broth. Heat a bit more coconut oil in the saucepan and add the onions and ginger. Saute over a medium heat until the onions are softened. Add the turmeric and a sprinkle of chilli flakes to taste. Add the sweet potato, the rest of the chicken stock and the cashews. Simmer the mixture until it thickens slightly and add the pork meatballs. Continue cooking for about 10 minutes just until the pork meatballs are cooked through. Serve with a sprinkle of chopped fresh coriander. Sounds delicious! I’ll add to my “meals to try” list for sure. Thanks for sharing. Lovely! I’ve recently stated eating paleo (and fructose-free, but that’s an allergy) and I’d love to see more of your recipes. Yay! Yummy. Yum! This sounds delicious! Can’t wait to try this. I would also love to see the pumpkin dhal recipe. 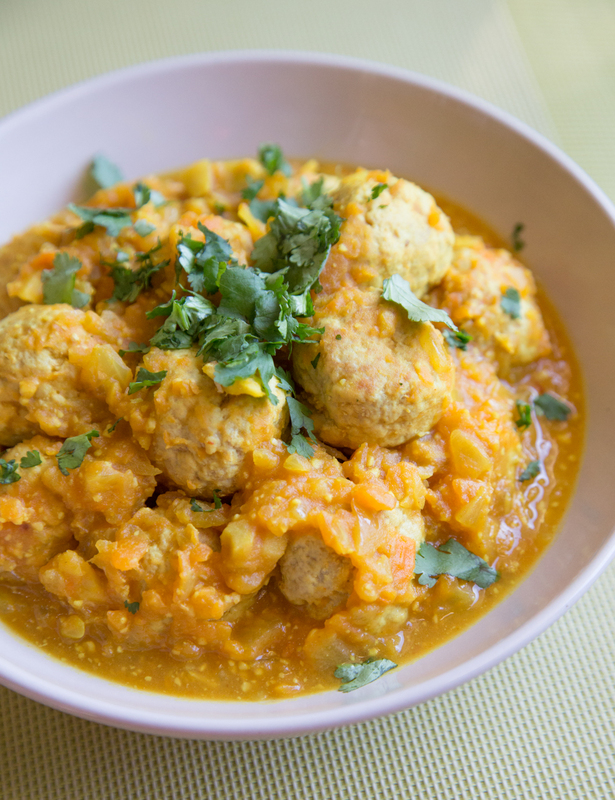 I would love to make my Mum’s dhal recipe but I don’t eat legumes! Hmmm delicious well done! and Congrats on your new Blog! Thank you! I’m such a big fan of your page and it means a lot to have your support! I’m so going to try this out!! My mouth is watering!